Last night I was skimming through Instagram, when someone I follow mentioned Shudder. They were explaining that Shudder is like Netflix, if Netflix had an actual good list of horror titles. Since I consider myself a bit of a horror genre fan, I went to check out the app and service. 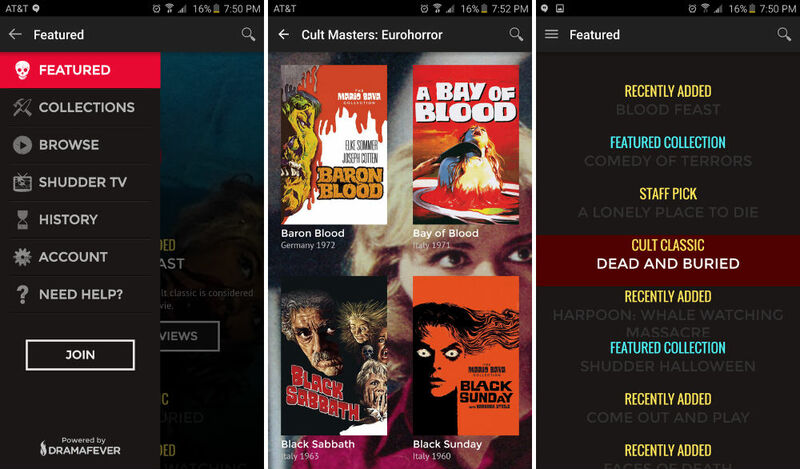 What I found on Shudder intrigued me, and the Android app is pretty solid. Shudder is exactly like Netflix, but only contains movies that could be labeled under the horror genre. However, it’s not just “scary” movies on the service. There are Horror Comedy, Slasher, Zombie, Alien titles, Monster movies, and so much more. Each list is completely curated, bringing a real personal feel to each title you see on the service. Movies can be watched on your desktop, mobile device, or Roku. As explained in the About Us section of the website, Shudder is, “curated by horror aficionados with a deep love and respect for the many peculiar varieties and genres of horror, presenting films you never knew existed along with old favorites that never fail to frighten.” To me, this is great, because on Netflix, Hulu, and even HBO, finding an awesome horror film can be a serious pain with the selection usually being junk. For pricing, the service costs just $4.99 a month, but you can try out Shudder for a week free if you sign up using a Facebook account – no credit card needed. To see every title currently available (more are added constantly), check here. One issue I find quite unfortunate is the app and desktop player’s lack of Chromecast and Android TV support. Don’t worry, the developers state that they are working to bring Chromecast support to the service ASAP. With Halloween right around the corner, I recommend you check out Shudder.